Origin: SR388 eggs transplanted to the Space Pirate Homeworld for implimentation into a renewed biological weapons project. 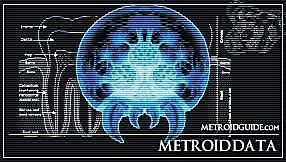 Note:Federation scientists are speculating that the Miniroid might be a phase of a Metroid life cycle that leads to the development of a Metroid Prime. Mysterious creature found on planet SR388. For which is thought to also be its native planet. Thought to be parasitic. An airborne life form totally capable of flight through it's almost weightlessness. Since the capture of the original Metroid specimens collected by the Galactic Federation expedition to SR388 the Space Pirates have attempted to breed Metroids for the bio warfare program; on the planet Zebes, planet Tallon IV, and planet Aether. All these attempts have failed because of the intervention of the Space Hunters Samus Aran who exterminated most specimens; still the Space Pirates retained enough Metroids to start once more again. This time the Space Pirates attempted to breed Metroids on their own homeworld. While the Space Pirates’ homeworld already caused interesting mutations to take place in the Metroid genetic strain, at some point the Space Pirate scientists decided to expose Metroid eggs to large quantities of Phazon material. The result is a complete new and unique strain of Metroid that has Phazon in its genetic makeup and feeds on both life energy and Phazon material; Phazon Metroids. Miniroids are similar to normal Metroid larvae that when they emerge from their egg, their shells are very thin and soft and they can be easily killed by other predators. For this reason Miniroids swarm together to increase their chances of survival, though some might be killed at least always a few will survive and grow into Phazon Metroids. Until they mature Miniroids seek out deposits of Phazon or small or weakened prey creatures on which they can feed, when they find such a prey they usually attack in large numbers attaching themselves like leeches. Like normal Metroid larvae Miniroids are extremely shy and will always move out of the way when they encounter stronger and larger creatures, trying to find a hiding spot until the creature moves away. Miniroids can easily be destroyed with weaponry and don’t pose much of a threat, the biggest danger when encountering the creatures is not themselves, but their guardians. 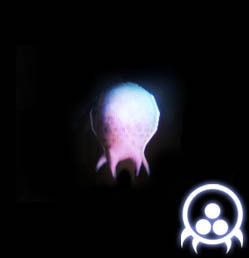 Instinctively the older Metroids such as Phazon Metroids will protect their younger cousins, attacking and feeding on those creatures that would try to attack the Miniroid swarm. 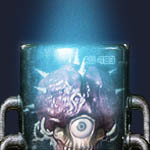 It is advised to be very cautious when encountering a Miniroid swarm, they are never alone.